Sorry, nothing much to say today. Missing Max incredibly. The previous Mig-23 Tigershark drawing of Max made a couple of, well, let's just say "immature" readers of this blog giggle a bit at the joyous smiles of the two pilots as they flew faster than the speed of sound while blasting their enemies to smithereens (sounds like a parent's view of good chemo). So in the spirit of showing a bit more of the twisted mind of Max, a selection taken from Max's last birthday card to Melissa, just this past May. The other two illustrations were of Max and mommy buying a video game for Max, together. And the two of them eating ice cream cones and watching TV together. This is Paul Maley - Sam Hutchison's Uncle (Margot's brother). I have been following Max's journey through Margot for a long time and I want to add my sympathies and condolences to the many that have already been expressed. I think that most parents can't really bring themselves to imagine what it would be like to lose a child for more than a millisecond - simply too overwhelming. I don't claim to be much different, but I guess I think about it pretty regularly because of Sam. There really isn't anything I can say that is going to offer much comfort. We just want you to know that our family here in Australia is thinking of you and we are so terribly sad that you have lost your beautiful little boy. We hope that you can comfort each other and take some joy & comfort from family & friends. Just want you to know I continue to visit Max's blog at least twice a day. I am so happy to see new pics and Max's art. I am pretty sure he's the one in the back on the gun--what do you think? Max continues to be a constant in my mind each day--his picture on my screen saver at work and at home. Sometimes I smile and sometimes I tear up--I always remember as I look into those precious eyes and see his warm, cute smile what is important and that puts purpose in my day. Live live to the Max!!!!! One step at a time, one day at a time and never, no matter what, never, never give up!! Thank Max for everything you gave and continue to give. God's Blessings!! I was just thinking of Max singing Ring of Fire yesterday and I love the new look of your blog. It was so sweet the way he sang "fire" with a slight "w" sound "fiyow". Don't need to tell you guys how much he is missed. I like seeing the continuing celebration of Max. And I feel for you loss -- I know its beyond words. Hi Guys! We too miss Max. You all continue to be in our constant thoughts and prayers! Thank you for the posts-it makes my day to see the art work and the pictures of sweet Max! That beautiful smile on Max's face! He is wearing his favorite shirt, too! Thank you for sharing his drawings... they bring so much of Max to us. We miss him. I love that you are sharing Max's drawings! This one shows a special story. The brave and strong mommy courageously blasting away while delivering her guy to the finish line. He knew what you were made of and that you would fight for him to the end. What a wonderfully special boy! I am humbled by your strength and spirit. Even in this season of mourning you are guiding US. God knew what he was doing when he loaned Max to you. I am so sorry for your loss... What can I say... You are in my thoughts and prayers. The entire Pueblo joins me in sending you a great big group hug. I am another who stumbled across Max's blog. I am so thankful I did. We have a 3.5 year old that has been dealing with some health issues and a cancer scare over the last year. Being able to read about you guys and pray for you has been such a blessing for us. I have never met you in person but feel like I know your hearts well. I appreciate your willingness to share. It helps. I keep praying for you guys. So does my son each night before bed. There are no words to take away your pain. We lost our first son at birth and I remember people almost avoiding us. It seemed better for people to just recognize your grief rather than pretend it away or avoid it! I am so thankful your posts again. I have loved getting to know your special boy, (your other two are precious too!). I only know Max through words, pictures, a view videos. But he is a child I will never forget. I know it seems silly but my family went to Chili's tonight and wrote, CURE NEUROBLASTOMA! 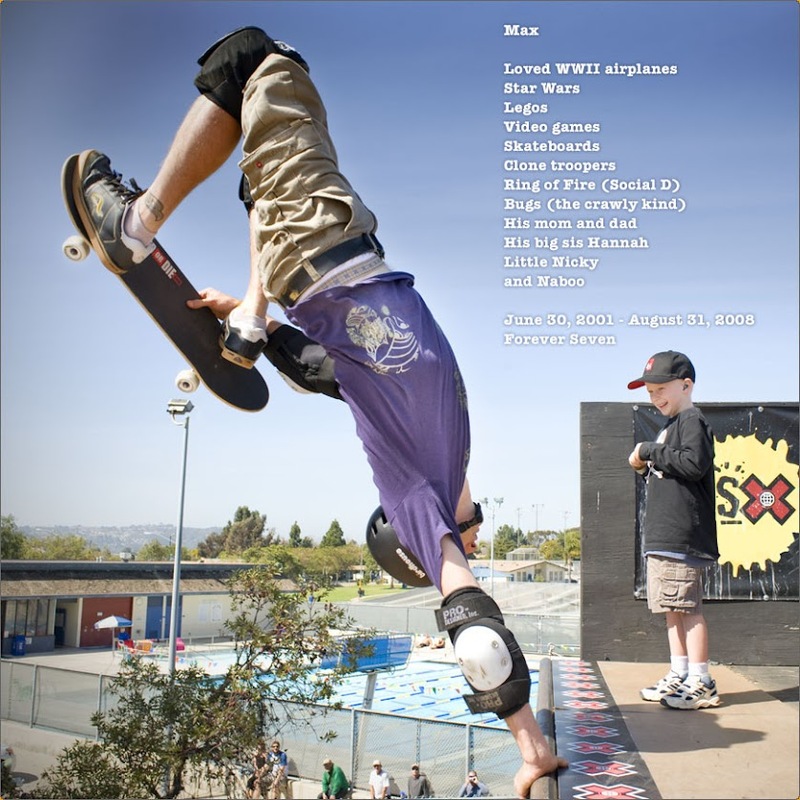 WE MISS YOU MAX! I just wanted you to know people everywhere wish you nothing but peace. Thanks for sharing these great drawings Max drew. What a bright kid! We are thinking of you all...hoping you are doing okay, knowing that this is a difficult time for you. What a great artist! The photo made me smile and the drawings made me chuckle. Great that the kids found something they cherish to put in Max's chair. Thanks for sharing Andy. Hope you, Melissa, Hannah, and Nikky are all do well.